Thank you, everyone, for the encouragement and kind comments. This new layout will keep you from wandering the streets then Jeff!! The way the Melbourne weather is at the moment, I think I'm glad to be indoors and doing something useful! 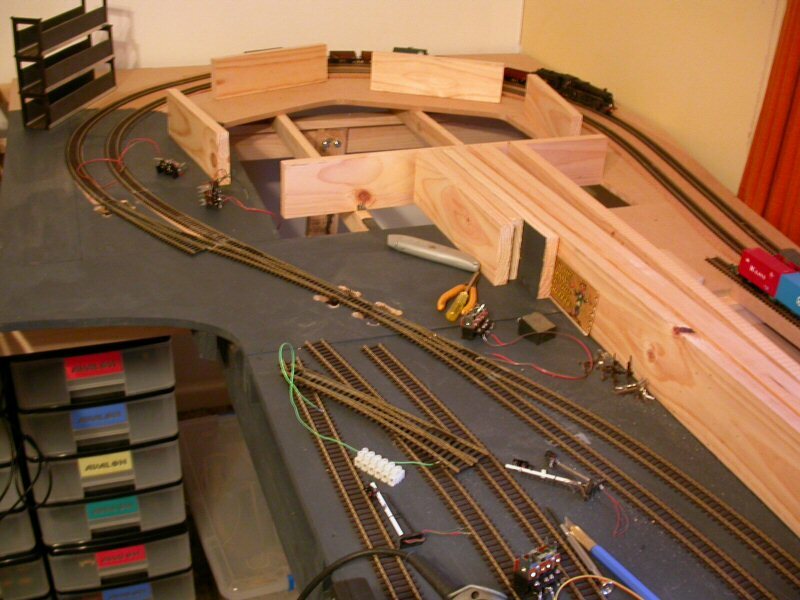 Today, I completed the wiring for the points at the right hand end of the layout and added a few more track feeds as well. Four more points to go and a couple of feet of track and I'll be able to run trains continuously. Today I laid the last pieces of track then marked out the holes for the point motors. 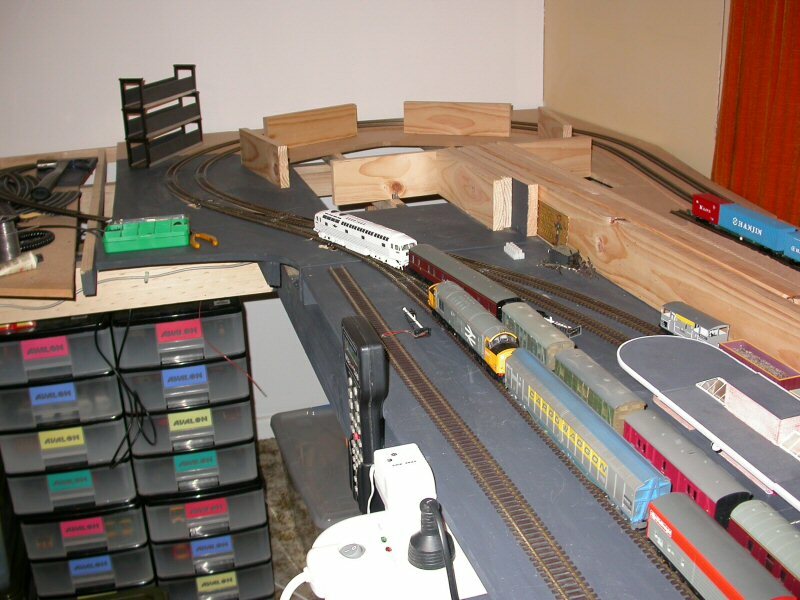 While I haven't connected the last few wires to the micro-switches yet, or added a couple more track feeds, I test ran train on each circuit as I completed them and, to my surprise, they ran perfectly throughout, although I know the 09 shunter won't yet make it through because of its short wheelbase. 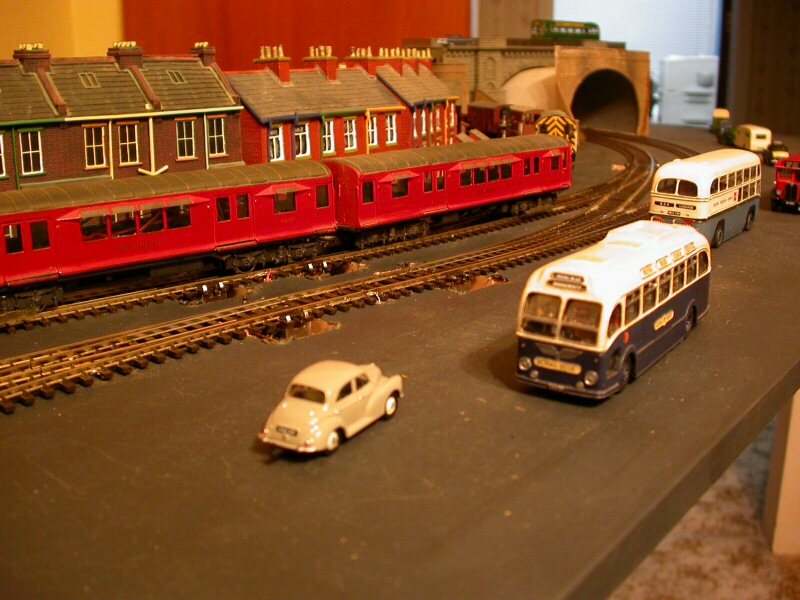 The following pics show the first, inner London Transport circuit connected up. Then the second, outer LT circuit was connected up and Lion ran with a short parcels train. The AMRA visits were quite successful yesterday, with no major disasters while the visitors were here - I did cause one accident before anyone arrived when I forgot to change a point, though! I placed a few buildings alongside the tracks and a couple of tunnel mouths and a bridge to represent the extent of the visible area once the upper tracks go in. I did take a couple of photos so will post them soon. So far, the only real problems I have encountered are with Hornby's classes 50 and 30/31, which tend to force lighter wagons or coaches off the track on some curves. This seems to be because of the coupling problem reported on several forums. I'll have to look into a short-term solution. Longer term, it shouldn't be such a problem as the main line curves will be a little gentler. After the last car load had left, I ran a few trains purely for my own pleasure. It is so nice to be able to run trains again! 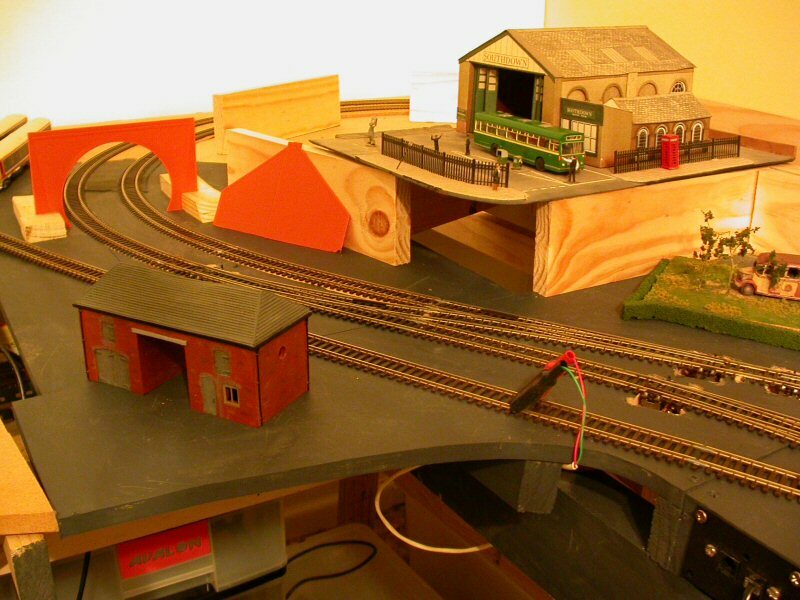 Here are some photos of the layout pretty much as the AMRA visitors saw it on Saturday 14th May (pics taken on 16th May). The tunnel mouths are close to where they should be in the greater plan, although they are definitely not the final appearance! Otherwise, most of the scenic items bear little resemblance to what will eventually be in their places. 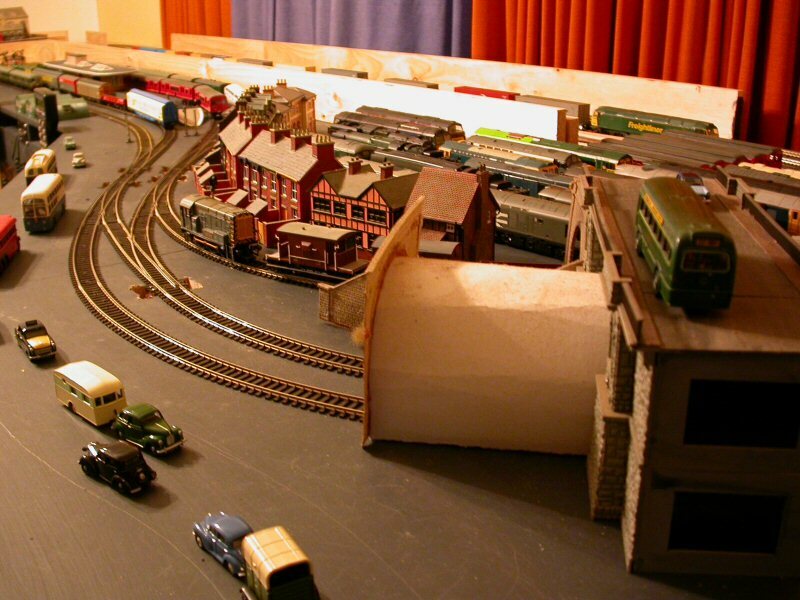 The road vehicles and nissen huts are where there will be viaducts and embankments carrying the main lines. 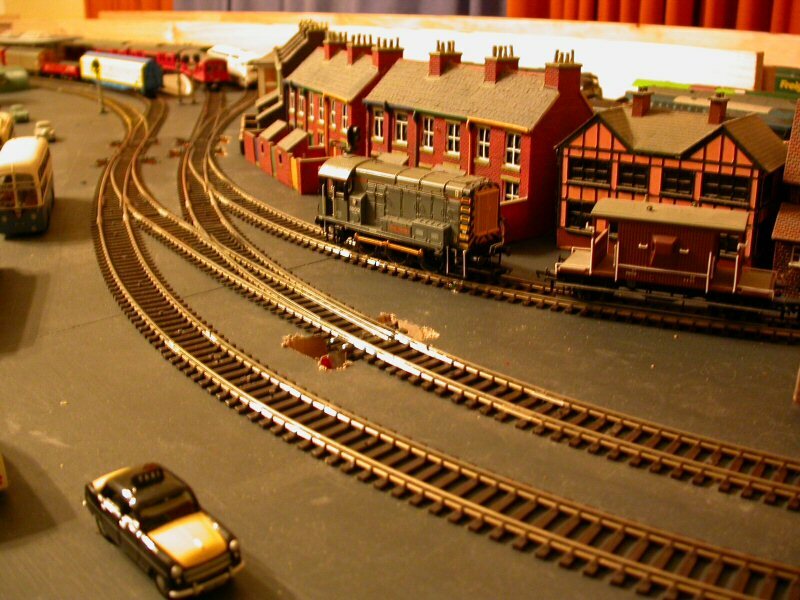 There may also be a road with a level crossing over the main lines and bridge over the LT lines but the final position will vary from the bridge placed for effect here. A little bit of work still to be undertaken I see. Jeff your layout seems to be progressing well, who makes the "Nissan" huts that are shon in your last set of shots ? The nissen huts are straight out of the box Hornby Skaledale units, Bozzy. 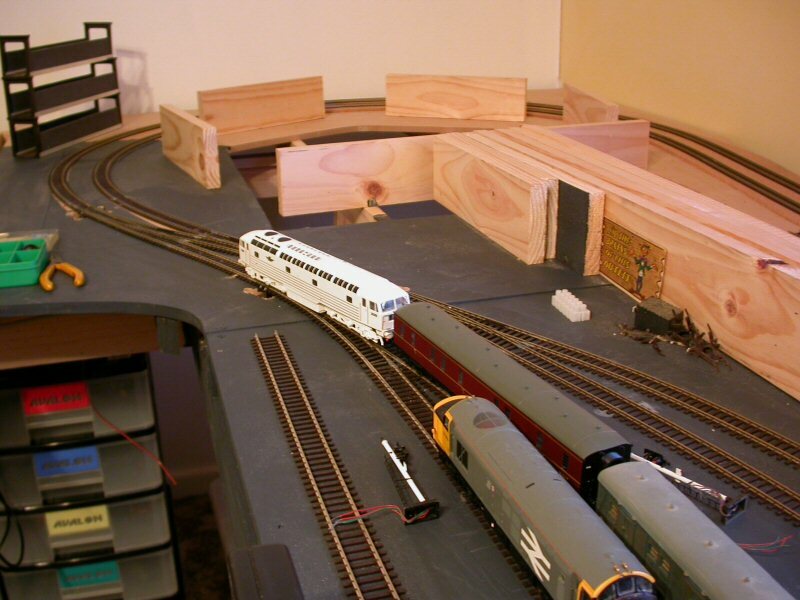 I note with interest that Bachmann are also going to release a slightly different design in their Scenecraft range. 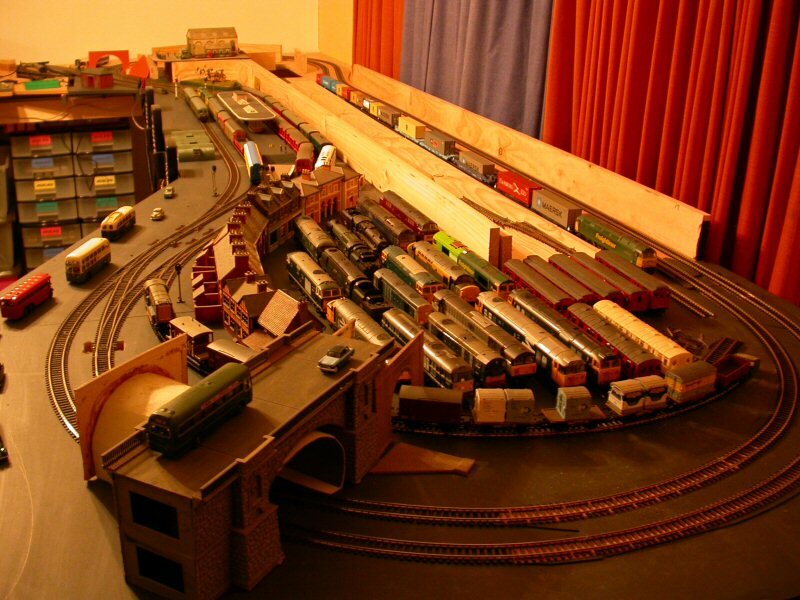 I've just caught up with this layout Jeff and I really have been impressed by what I've seen. There's obviously a lot of effort gone into it so far and it's going to be great when it's finished. I love the tube stock - and the "Lion" and the "High Street" - oh and the nissen huts look good and .............I could go on but you get the general idea that I like it !!! Thanks for the kind comments, Peter. 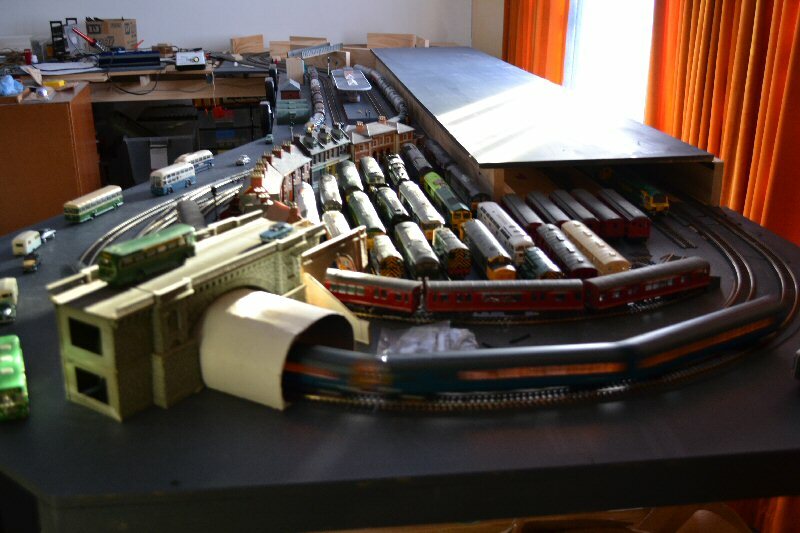 As with many modellers, I have way too many locomotives for the size of my layout! Most of those in the pic have sound fitted so were "on hand" for any requests from the visitors. 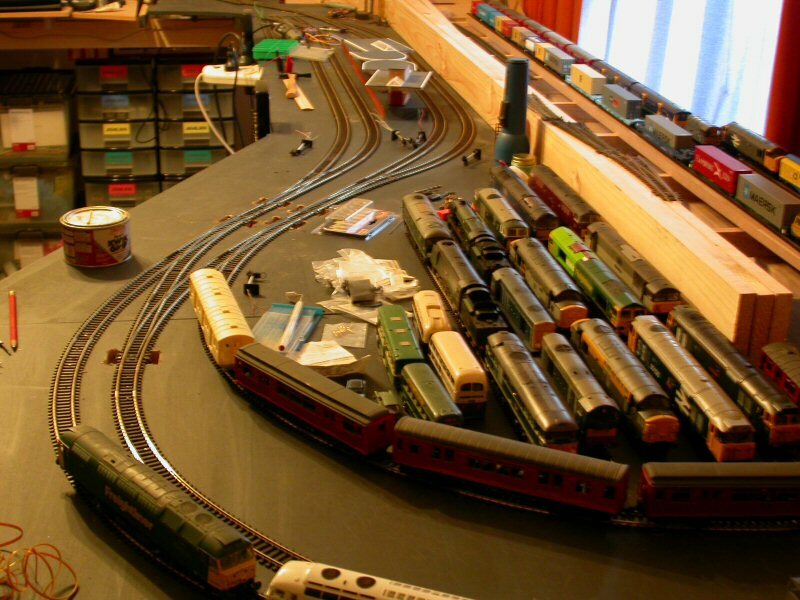 I followed your old layout on another forum before I joined this one ( I assume there is only one SR Man who lives in OZ). This new one is coming on nicely. I like the look of the terrace houses are they scratchbuilt? Your guess is correct: I appear on several forums (fora??) under the same name - it's a lot less confusing for me!! The terraced buildings (houses and shops) are Scenix, by Pocketbond. They are not too bad but lack refinements like see-through windows, which you do find on Hornby's Skaledale and Bachmann's Scenecraft ranges. Next installment: Doug dropped over today with the hinged lift-up fiddle yard board for the upper level and helped install it ... more specifically, he installed it and I assisted! He even pre-painted it for me. 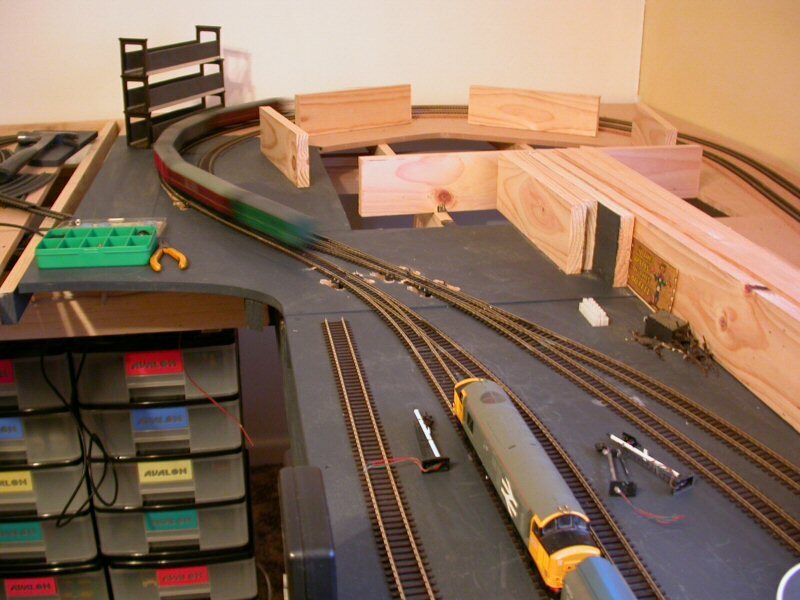 I will have to trim parts of the front edges to suit the track layout below but this is minor compared to all the hard work Doug has put into my layout. There were two trains in motion when I took these shots, using my new DSLR camera (I still have my 'L' plates on for using that!). 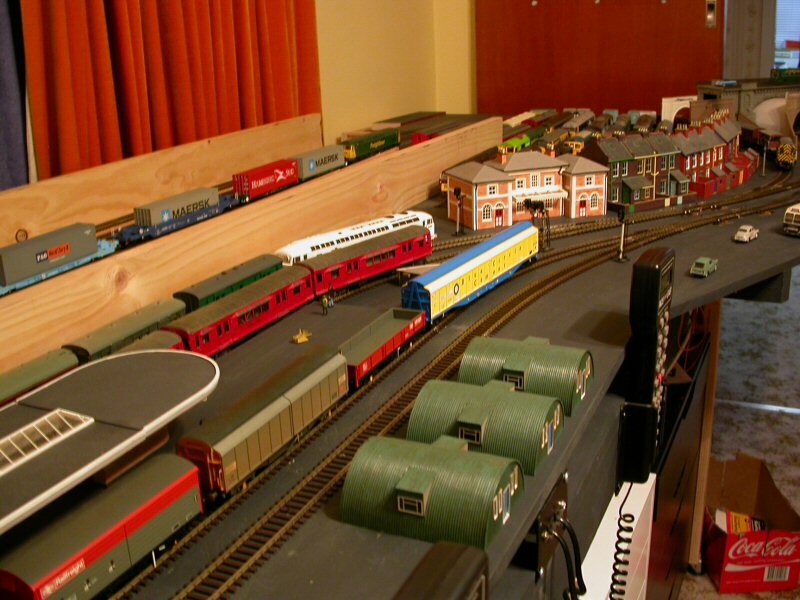 The trains are a pair of blue Bachmann 2EPB units (consisted) and a Bachmann green 4CEP unit. The plate girder bridge over the far end of the LT station represents an approximate alignment for the overhead tracks of the main lines although the proper structure will be double-tracked. Nice one Jeff, Its good to have friends . Your railway is really taking shape and the overhead mainline will certainly add to operating and visual interest. Good luck with the ballasting. I have been blessed to have Doug as a friend. His carpentry skills are everything mine are not! The main lines will have a bit more operational potential than the Underground lines, although the track design allows me to reverse services from any of the through lines. Ballasting it all is going to be such fun ... NOT! 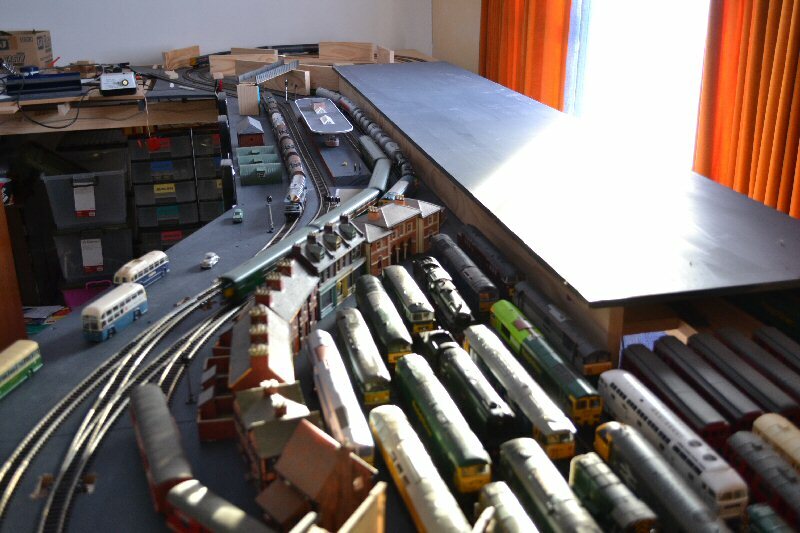 The fiddle yard is going to be open to view so all of that will have to be ballasted as well. 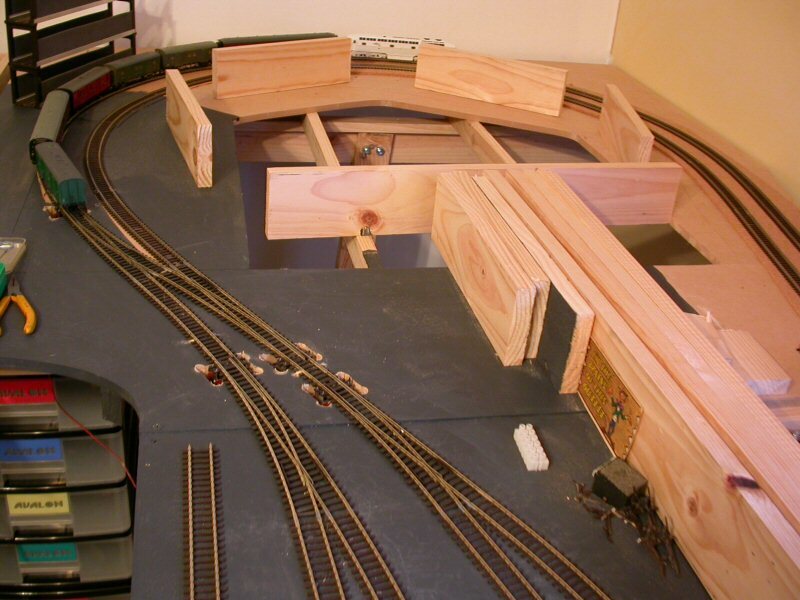 Laying third rail through all of the main lines and fiddle yard is also going to be a challenge as is the task of laying third and foourth rail over the visible parts of the Underground. Peco will love me by the time I'm finished! John, it has come on faster than I could have hoped, although much of that is due to Doug's generosity. While I can run trains now, the practical length is severely restricted by the loop and siding lengths. I'll certainly be happeir still when I can run full-length trains. 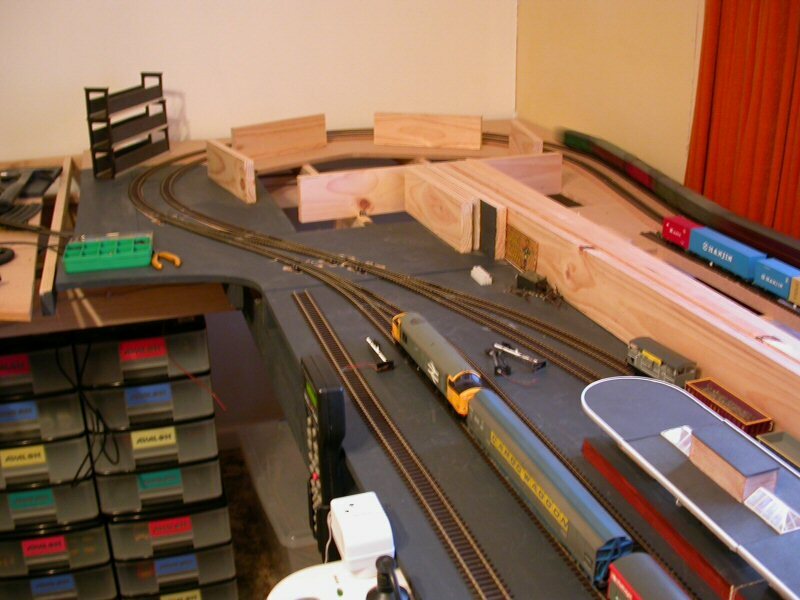 Great layout and you have made considerable progress. I like the island platform building which reminds me of the station at Harrow-on-the-Hill. Is it scratch built?